There are some differences. Look here. 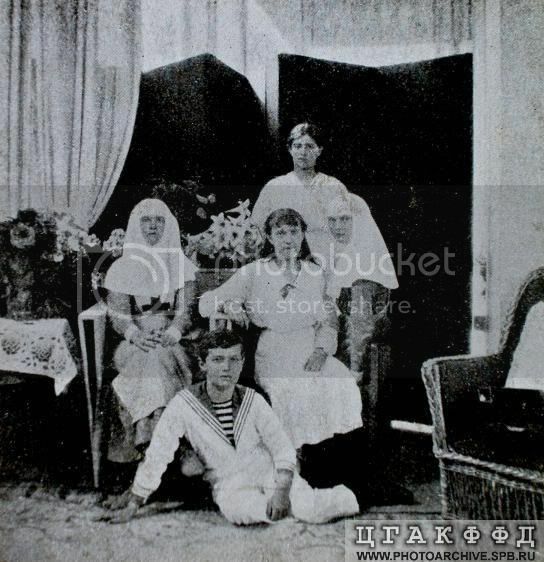 I think it is one of Standart cabin of Nicholas II, not sure. ca. 1909. Nice photo! I was looking at pictures from that day- there are a few of the girls on deck. But it looks like there's a long ribbon on the front of their dresses that I can't see in the photos posted earlier. So I'm not sure if that's a picture from the same day or not. 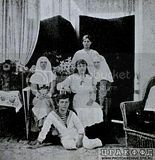 And to me Grand Duchess Anastasia and Maria looks older on the pic of them in the cabin. I think they're the same -- the one in the frame has been straightened. WOW! The pictures on the first thread! I've never really seen those before. They are really beautiful photos. That one was taken in 1915. Thank you for that clearer version. Can be found in Alexandra's album. There is similar version of that one. Ah, yes! Thank you, Ally. It's much clearer and I think larger than what I previously had. My apologies, thanks to Douglas who corrected me. It is 'Standart' Yacht too.